Investing in a luxury leather sofa for your home could be the best thing you’ve ever done – as long as you know how to keep the precious item in pristine condition. That’s easier said than done if you have pets, kids or even a messy partner. Leather is an extremely durable material, but that doesn’t mean it’s invincible. The worst thing you can do is to neglect your leather sofa, somehow expecting it to stand the test of time without any attention at all. It won’t, and your investment buy will have a much shorter lifespan than you may have hoped for. If you want to get many years of enjoyment out of your leather sofa, letting it age gracefully and adding character over the years, you need to know how to maintain it properly. 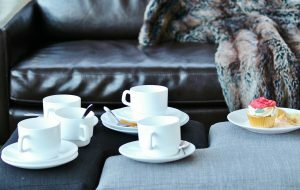 Regular maintenance starts with dusting and hoovering to keep your sofa looking sharp. Make a point of running a soft dusting cloth or the soft furnishing attachment of your vacuum cleaner over your leather sofa at least once a week to prevent dirt and debris settling into the creases. Another option is to use dust covers or lightweight sheets to protect the sofa from dust, grime and sunlight when not in use, although depending on where your leather sofa is situated in your house, this can spoil the overall look. If your dogs love lying on the leather sofa as much as you do, or your (grand)children have a habit of putting greasy fingers everywhere, you should wipe down the sofa frequently to avoid chemical build up from body oils. Do make sure you test your damp cloth on an inconspicuous area of leather first, to make sure the leather doesn’t absorb the water, causing staining. Sunlight and heat are not great for the condition of your leather sofa – two factors you should consider when deciding on where to position your sofa in your home. Heat causes leather to dry out and eventually crack, so it’s a bad idea to place a leather sofa in direct sunlight or too near a fireplace. If the location can’t be helped, it’s advisable to pay extra attention to leather care and conditioning. Prolong the life of your leather furniture by using a specialist leather protector product. This will reduce the extent of dirt accumulation on the fabric, which means less cleaning will be required. Once or twice a year, apply a leather conditioning product or ‘hide food’ to nourish it and keep it soft and supple. You may not necessarily notice the benefits straight away but, over time, leather conditioning will help it age nicely. When applying any leather product, stretch out any creases to make sure the product reaches every part of the leather. It goes without saying that you should only use leather products that are recommended by the manufacturer or retailer. Occasionally, leather can become damaged as a result of sharp objects. Light scratches or markings can usually be dealt with effectively by buffing with a chamois leather cloth. However, if the material has been pierced, professional advice needs to be sought. Sometimes, accidental spills on leather can simply be mopped up. However, depending on the nature of the stain and the type of leather involved, stains can be hard to deal with. In addition to liquid spills, leather can also stain as a result of heavily colour dyed or printed items rubbing off. Generally speaking, it’s best to deal with a spillage as soon as possible – don’t let it set. Often, spills can be removed before they start to discolour the leather. Try dry blotting with a soft cloth first to remove the spillage, taking care to dab and blot, not wipe. Wiping the stain may cause it to spread further. A damp cloth may be used if blotting alone is not enough, however some grease stains (including food) can be made worse by the application of water, and water itself can also cause staining, so do be careful. A water based cleaner may be suitable for some non-oil based stains – check instructions. Strong cleaning detergents that contain harsh chemicals, oils, waxes, saddle soaps or silicones are not recommended for DIY use as they can exacerbate the problem rather than solving it. Leather cleaning and stain removal is not for the faint hearted. If you are not sure what to do to restore your pride and joy, or are worried about making matters worse than they already are, a leather cleaning specialist can help. Apple Clean’s professional leather cleaning services are Clean Trust certified with over 20 years’ experience. Our professional cleaning methods are carried out in situ and are recommended by leading manufacturers.